It is no secret that certain countries overspend in certain areas of their budget- whether on defense expenditures, education, health, infrastructure, or social services. Of course, placing an emphasis on one section of the budget leads to positive and negative ramifications for the guilty country. Many of us have heard stories: The Chinese taking over the world with their advanced military, the free health care in certain European countries, money for going to school in Denmark, and other interesting (and sometimes wrong) points that have crept into our minds thanks to the Media. In this blog, I will analyze the statistics behind budget inequality and its ramifications. I promise you will find this amusing. 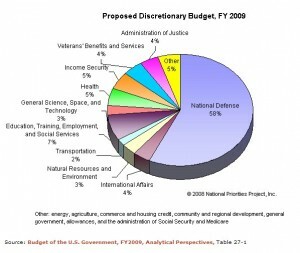 Yes, thats 58% of the 3.1 TRILLION Federal Budget on Defense. If a family spent over half its money on defense, it would be starving, illiterate, and without shelter, and broke. 2. Yemen – 9.5% Literacy Rate: 67% (UN) Note: Yemen has recently made education its top priority. The United States ranks far behind most developed countries and several second-world countries. Post-Soviet nations such as Belarus, Ukraine, Georgia and Armenia have literacy rates over 99.5%. Amazingly, the US Spends 2 trillion dollars in both public and private sectors, but the leading cause of bankruptcy is medical and our spending is far less efficient that countries like Cuba, Singapore, and Japan. In Japan, the life expectancy of 82.6 years is the highest in the world. Yet, most Japanese live in industrialized areas, such as Tokyo. 1. 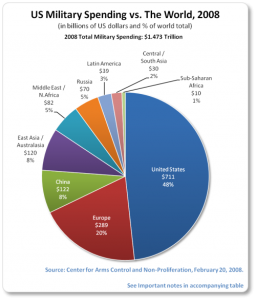 United States (19.2 %) – 41.5 % of the World Defense Spending. 96th on Global Peace ranking. With the exception of Oman and Qatar, both peaceful Arabian peninsula states, countries with high defense spending usually are the least peaceful. Least peaceful countries have more deaths due to war, economic instability, and less focus on social services. 13. United States (12.6%) – 17th happiest in the world. The correlation cannot be rejected. 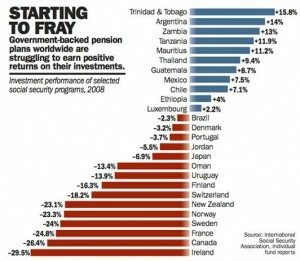 If one looks at the list of happy countries, most of them stress social services above all forms of government expenditure. Happiness also leads to longer lives (Sweden is third in life expectancy). Natural resource conservation has been growing all around the world as global warming fears heighten. It is also used as a political tool for both Democrats and Republicans. The point of this article is one. The current fiscal crisis and federal deficit is going to have to be paid somehow. Already, $250 Billion a year is spent just paying the interest on the national debt and with trillions more being tacked on, where is the funding going to come from? It’s simple: the feds will cut back on vital funding for education, slash social services and health care, and increase taxes. What we need is someone in charge that can manage the debt, and although a surplus looks like a very bleak possibility, and balance the ballooning budget without compromising the necessary expenditures.